Satellite Feature Identification: Ring of Fire introduces forecasters to the potentially damaging convection that can develop in conjunction with blocking high pressure centers and examines how to identify it from a water vapor imagery perspective. This module is part of the series "Dynamic Feature Identification: The Satellite Palette". * List the forecasting advantages of identifying and analyzing Ring of Fire convection via water vapor satellite imagery. * Describe the typical synoptic conditions leading to Ring of Fire convection. * Identify Ring of Fire patterns present in water vapor imagery. * List what types of convection develop, their location, and what kind of damage they can produce in a Ring of Fire event. 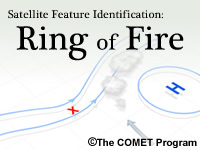 * Indicate when a Ring of Fire pattern is dissipating by using water vapor satellite animations. The Skill Level rating for this module was changed from level 3 to level 2 on August 23, 2011.